What is it? 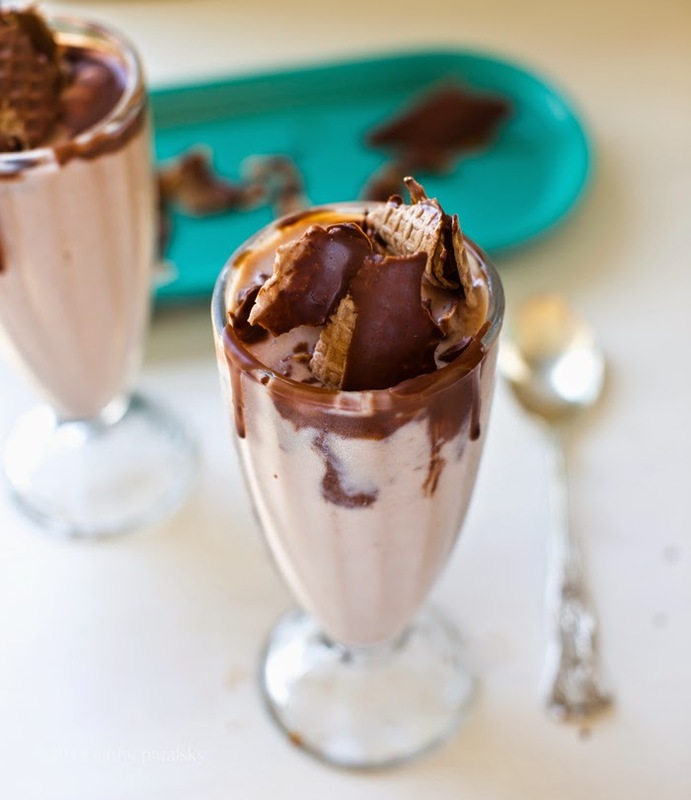 This is a duo of frosty bliss shakes, drizzled in chocolate coconut sauce that forms a silky shell, plenty of chocolate drenched "sweet taco" pieces on top. Flavor accents of vanilla, nut butter, banana and CHOCOLATE.. 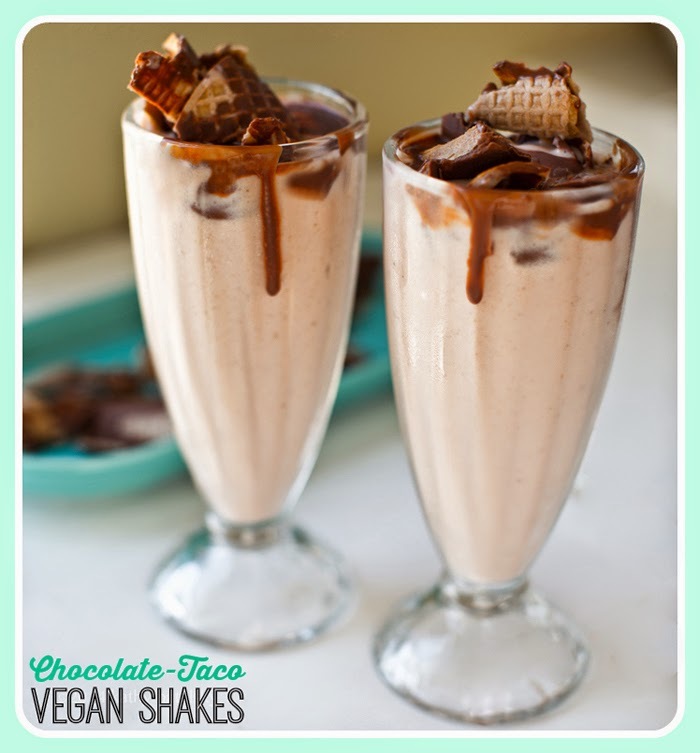 This Peanut-Chocolate-Taco Shake is not only sweet and delicious - it is also rather healthy! You will feel like you are indulging, but once you check out the ingredients you will feel super good about your decision to join in the chocolate taco fun. 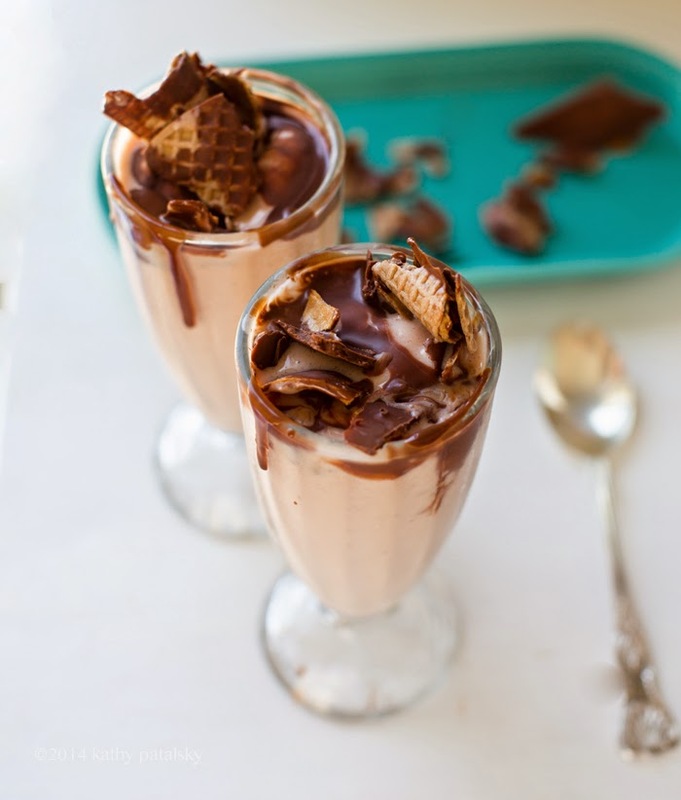 And to ease you into this easy healthy-dessert recipe, I have a video with the steps..
Frosty healthy-delicious peanut-banana shakes with crispy chocolate taco bits on top! A taste of childhood, gone vegan! Combine chocolate chips and oil in a small bowl. Microwave for 30-60 seconds and stir briskly until silky. Alternative method: melt on your stovetop. Crush the cone bits and lay out some parchment paper on a platter. Dip the cone bits in the chocolate and lay them on the parchment paper. Or the fast messy method, simply drizzle the chocolate over top the bits and break them apart when they cool. Place the cone bits in the freezer for 1-2 minutes until the chocolate hardens up. Add the banana, watermelon, non-dairy milk, vanilla, nut butter to a blender and blend from low to high until frosty and smooth. Use as little vegan milk as possible to blend to achieve the thickest shake-like texture. Pour the shakes. Drizzle generous amounts of the leftover chocolate sauce on the shake and into the glass. Garnish with the chocolate covered cone bits on top. Yes you will have leftover cone bits, but they are delicious for nibbling alongside your shake or store them in the freezer and save them for later.